Wickham Type 27 Trolley Car BR Engineers Yellow Wasp Stripes. Wickham Type 27 Trolley Car BR Engineers Yellow. Wickham Type 27 Trolley Car BR Maroon. Class 66 66728 'Institution of Railway Operators' GBRF - Weathered. 3 Car DMU. BR Blue Full Yellow Ends. 2 Car DMU. BR Blue/Grey Full Yellow Ends. Class 47/4 47814 ‘Totnes Castle’ Virgin Trains (Original). Class 47 47727 'Rebecca' Colas Rail livery. 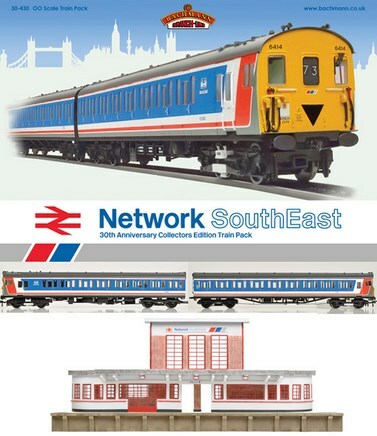 South East Bachmann dealers exclusive edition. Class 37/0 Split Headcode 37012 ‘Loch Rannoch’ BR Blue (Large Logo) with DCC Sound Fitted. Class 37/0 Split Headcode 37012 ‘Loch Rannoch’ BR Blue (Large Logo). Class 37/0 37099 "Merl Evans 1947-2016" Colas Rail Freight livery. Class 37/0 with Centre Head Code. No. 37242 Mainline Blue - Weathered. Class 37/0 No 37104 Railfreight Triple Grey (General Sector) with Cockney Sparrow with DCC Sound. Stratford-based, one of only four engines to receive the Railfreight parent logo devised when British Rail’s heavy haulage business was restructured in 1987. Class 37/0 No 37104 Railfreight Triple Grey (General Sector) with Cockney Sparrow. Class 66 66040 EWS (DCC Sound). Class 44 D3 'Skiddaw' BR Green – DCC Sound. Class 40 97407 BR Blue Departmental Indicator Discs Weathered. Class 25/3 25286 BR Blue Domino Head Code. Class 37/7 37884 Europhoenix with DCC Sound. Class 37/4 37425 "Sir Robert McAlpine" in DRS compass blue - Limited Edition for London and South Eastern Bachmann retailers. 2 Car DMU BR Blue & Grey. Two Car DMU BR Green with small yellow panel. Class 08 08907 DB Schenker Red. Class 43 'Warship' D865 'Zealous' BR Maroon with small yellow panels. Class 20 20141 BR Green Full Yellow Ends Weathered. LMS 10000 BR Brunswick Green, Lined Orange & Black. E3095 BR Electric Blue Small Yellow Panel. Type AL5 Electric E3056 BR Blue (Pre-TOPS) Single Pantograph. 47001 BR Blue - Weathered. 47190 'PECTINIDAE' BR Petroleum Sector - Weathered. Class 47 47256 BR Green Full Yellow Ends (TOPS) Weathered. Class 70 70015 Freightliner (Air Intake Modifications). Multi-Purpose Vehicle (MPV) - Network Rail. "Power Twin" 2 Car DMU BR Blue Yellow ends. Class 03 D2383 BR Green Wasp Stripes & 'Flowerpot' exhaust - Weathered. Class 419, Motor Luggage Van (MLV) in BR 'Jaffa Cake' Livery. Class 419, Motor Luggage Van (MLV) in BR (SR) Green. Type 2-H. 2 Car "Hampshire" Diesel Electric Unit often known as "Thumpers". No. 1122 in BR Blue Livery with full yellow ends. 4 Car EMU 450127 South West Trains Weathered. 4 Car EMU 450073 South West Trains. Class 416 2-EPB EMU Set number 6414 in Network SouthEast Livery, Low Relief Art Deco station building, platform sections x 2, Collectable NSE publicity prints, Reproduction Network Card and holder. 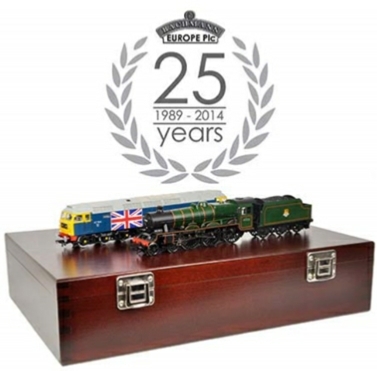 2014 was a very special year for Bachmann Europe Plc, celebrating 25 years of producing high quality model railway products. This pack has been produced to commemorate the 25th anniversary and contains a Jubilee class No.45552 'Silver Jubilee' in BR Lined Green livery with Early Emblem and the Class 47 model No.47164 in BR Blue livery with Yellow Ends and a Union flag on the side, painted as such for the Silver Jubilee in 1977. Each pair is contained within a special wooden box, finished with a silver foiled 25th anniversary logo and a numbered certificate. A must-have for the collector and modeller alike. All items are in descending numerical item order.